Cavitation is the sudden formation and collapse of vapor bubbles (or cavities) in a liquid due to a pressure fluctuation. As the bubble collapses it sends intense pressure fluctuations, or shockwaves, to the surrounding liquid. Our ApoWave® technology system harnesses these intense shockwaves for high-efficiency extraction and for through mixing. As either the wort or the beer flows through the ApoWave® unit, a patented non-shearing, high-speed rotor induces cavitation. The intensity of the cavitation and amount of energy transfer from the motor to the liquid can be adjusted by regulating the rotational speed of the rotor or by controlling the liquid flow through the unit. High intensity cavitation is ideal for extraction of resins and oils from hops as well as flavor and aromatic compounds from beer ingredients such as coffee, cocoa, chocolate, orange peel and spices. A gentler cavitation is ideal for mixing fruits and concentrates, marshmallow cream, hop extracts, and other liquid or dry soluble ingredients. By adjusting beer flow rates and rotor speeds, a single same ApoWave® unit can be used for either extraction or mixing applications. As the beer, or wort, mixed with hops travels through the ApoWave® unit, the intense pressure fluctuations generated by cavitation drives the liquid into and out of each hop particle. This “plunger effect” takes places thousands of times per second resulting in an instant extraction of hop compounds. Recirculation mode: Immediately after the hops or other ingredients are added to the fermenter, a brewery pump is used to circulate the beer and hops mixture from the bottom port of the fermenter to the ApoWave unit and back in through the racking arm. In-line dosing mode: Using Apotek’s exclusive In-Line Hop Dosing System, beer from the bottom port of the fermenter is pumped through the hop dosing unit, which has been previously filled with hops and purged with CO2. As the beer flows through the unit, our exclusive rotary valve design allows a constant flow of hop pellets into the beer stream. The beer/hops mix then travels through the ApoWave® unit for fast and efficient extraction of hop compounds. 10% to 30% reduction in hops used for dry hopping. Eliminate rest times as the extraction is complete by the time the beer exits the system. A reduction in hop usage can result in increased beer yield due to reduced plant material in the fermenter. Enhanced and more complex aroma notes from aromatic hops. When circulating toasted oak (Applewood? Mesquite?) through the system, complex flavors can be quickly added to beers that are achieved traditionally by barrel aging. In principle, the mixing application is very similar to extraction. 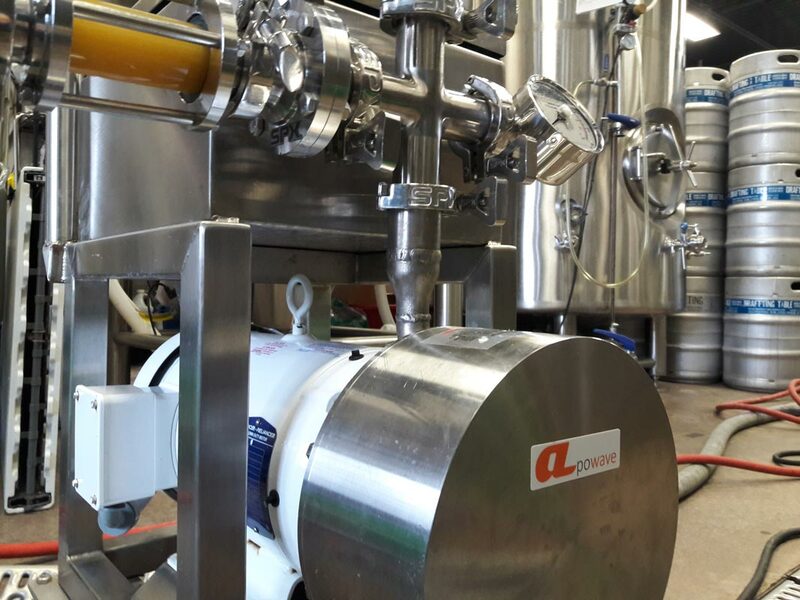 As the beer mixed with the fruit puree or concentrates travels through the ApoWave® unit, the intense pressure fluctuations generated by cavitation thoroughly disperse the dense fruit into the beer. The end result is a uniformly mixed beer with incredible aroma and color. For this application the system can also be easily incorporated into day to day operations using the in-line dosing mode. Fruit from barrels or buckets can be pumped directly into the beer flowing through the ApoWave unit using a standard Tee. The Tee is installed at the suction side of the beer transfer pump. As the beer and fruit mixture flows through the cavitation zone of the unit, the fruit is thoroughly mixed with the beer. Enhanced fruit flavor, aroma and color transfer into the beer. This can translate into direct savings as the beer would require less fruit to achieve the same profile. Completely eliminate the commonly found “layers” in the fermenter; i.e. highly concentrated fruit at the bottom and practically no fruit dispersed at the top. In other words: Better Beer!